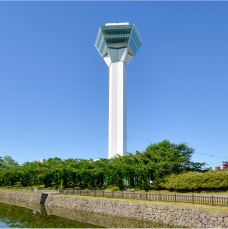 When members of the media wish to conduct interviews or film inside Goryokaku Tower or the observation deck for such a purpose in Goryokaku, please fill out the media request form and send it via fax or mail. *Please submit the request form before 5 p.m. one day before the desired date of filming. *If you have any questions, please contact us via telephone or inquiry form. For inquiries and submission, contact the Planning Office, Goryokaku Tower Corporation. In addition, please contact below for media inquiries regarding interviews and filming within the premises of the national historic site, Goryokaku (Goryokaku Park).